Factory X had call me again this afternoon. They ask me to reconsider their offer to join their factory. Few months back, I reject their offer and they got quite mad about it. But now they ask me again nicely. This is not a random crappy offer, as they are willing to paid 1000 gold coins more of what I am getting now. At the same time, I was hoping to start my own cheese factory too. But if I join factory X, I am quite sure I won't have anymore time for myself to make my own cheese. So how? I don't know how but I manage to come up with a few big plans again. Stay in mushroom factory, and start my own cheese factory slowly. Escape from mushroom factory, and start my own cheese factory instantly. Escape from mushroom factory, and join factory X. If I join factory X, I won't have much time for myself to start my cheese factory. Sleep now, and will ask god what is the next step in my dream. 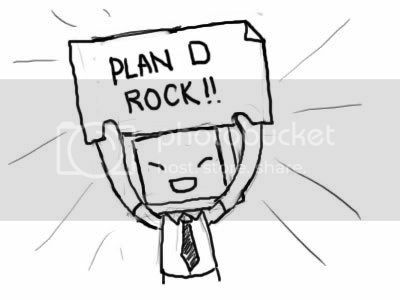 As usual, I choose plan D again because it is always the best plan. have the fear to do something different..
true, sometime if too many option to let me choose. I tend to feel lose and don't know what to do. Then I will just stay there and don't move. If I got this same type of offer one year ago, I guess I alraedy send the bomb to the king straight away without thinking. But now, there are too many factors affecting my decision at the moment... need to think. Whether you start a your own factory or not. You still have to quit your current factory. So just quit it, move on, then plan for the new factory. It's never wrong that way. Because making a new factory takes time. But the factory that opened their arms for you don't have much time. When ur own factory grow then quit the new factory lo.